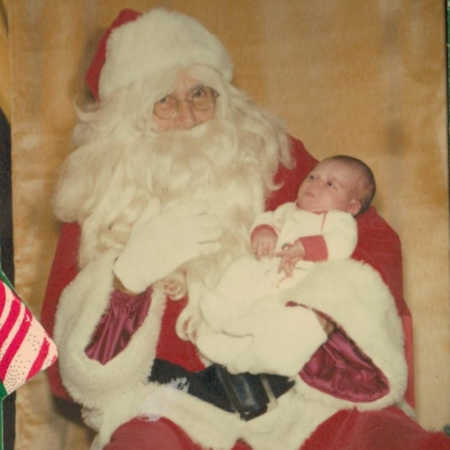 “In 1989, at barely 2 weeks old, my first born son had his initial visit to Santa. The mall Santa was very apprehensive about holding the tiny baby handed over to him. The pictures at that time were about as poor as the mall Santa’s outfit but it was saved and cherished all the same. 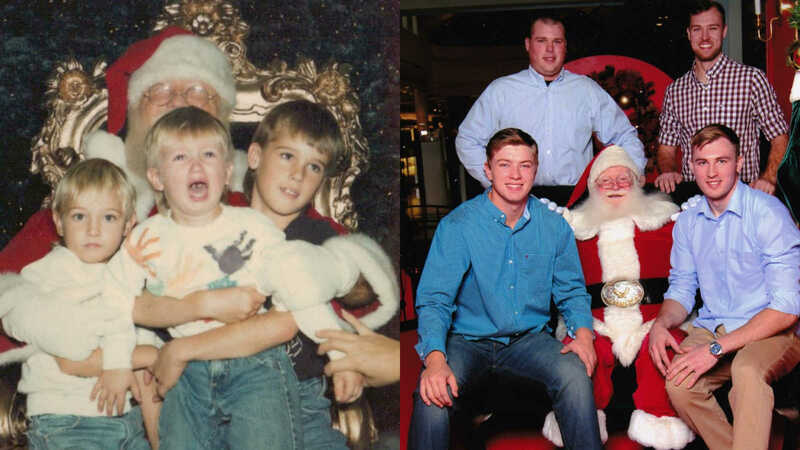 He continued his visits to Santa every year and in 1993 another son was added to Santa’s lap. The photos back then were instant Polaroids and the malls didn’t sell picture packages for several more years. But we took our pictures and displayed them every Christmas. Boy #1 was getting older and able to give Santa his wish list. Shockingly, when asked what he wanted he said, ‘I don’t know. I have everything I need.’ WOW. What 3 year old doesn’t have a list a mile long? He was one of those kids who would get excited over a banana in a paper bag. Yeah, that would change in future years but for now Christmas morning was mesmerizing. In 1995 and 1998, after a move south to live closer to their grandparents, 2 more boys, were added to our crew. I noticed that when Santa went to SC he changed. His beard lost its cottony fluff and was replaced by course white hair. With 4 boys under the age of 10, this was now becoming their only group portrait. Olan Mills photo studio was expensive! And the schools were selling fall And spring pictures every year. So the Santa photos became our tradition. The elves helping Santa with the camera would do their best to get all the boys in place and smiling but anyone with young children knows it’s about as easy as wrangling a herd of greased pigs. Unfortunately, many of these include mommy holding one or more of the kids in place. And I should have thought to bring the dentist along since I could see all his teeth deep inside my son’s crying mouth! But if this was the year they were thrilled to visit Jolly Ol’ Saint Nick, I wanted to remember. After separating from their dad in 1999, a lot of our family traditions would change with visitation schedules and strained finances. As the boys grew and began engaging in school activities, we weren’t together as much. But we would find a night in December where we went to the mall for the picture and took a ride through the town’s free Live Nativity. They laughed at the former year’s pictures as they were displayed with the rest of the decorations. With limited counter space, we started a ‘Santa Wall’ using an old tree skirt hung up near the tree. They would make their Santa wish list by cutting pictures out of the Thanksgiving newspaper ads. We would hang up the list with the pictures until our trip to the mall when they would give it to Santa. Around 2002, life was getting pretty dark for me personally. I was struggling with the divorce which was still in separation status due to my (now) ex. My church put the boys’ names on their angel tree. They also provided our Thanksgiving and Christmas meals. My friend’s husband showed up at my door with a raggedly little Christmas tree that we made beautiful. UPS delivered mysterious gift boxes. I honestly bawled over pudding packs inside. It was a luxury that I couldn’t afford for my boys. What I didn’t want to skimp on though, was their Santa picture. 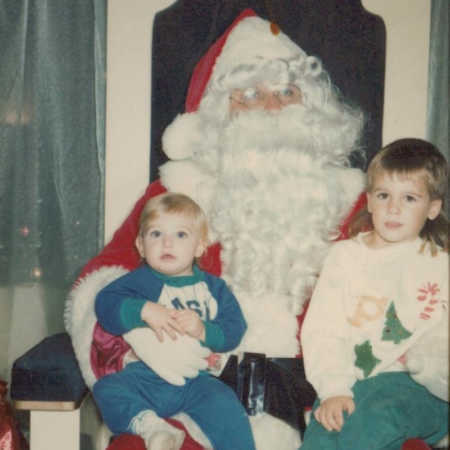 I went to the mall that year and sat in front of the big chair listening to my boys rattle off their wish list to Santa. Tears filled my eyes as I knew they would probably never receive all these things. But it was Christmas. Christmas is a magical time, right? Sniffling as they were jumping down off his lap, Santa stood up, faced me and asked, ‘And what does mom want this year?’ Crying, I quietly answered, ‘A New Life?’ Santa hugged me and whispered in my ear, ‘I’ll see what I can do.’ I smiled back at him and then wished I had box of tissues in my purse. In 2003 I met my new best friend. He was my boulder. He brought the light back to my life. Although it would take over 2 more harrowing years to break free from my controlling ex, this man stood by my side and helped me care for the boys. A year after my divorce I married this man! He brought along 2 of his own children who would join us on our Santa Wall. Life began to change in the most wonderful way. 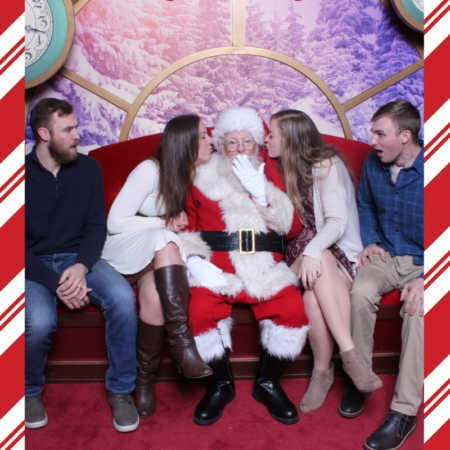 The visit to Santa with our kids now meant more than ever! 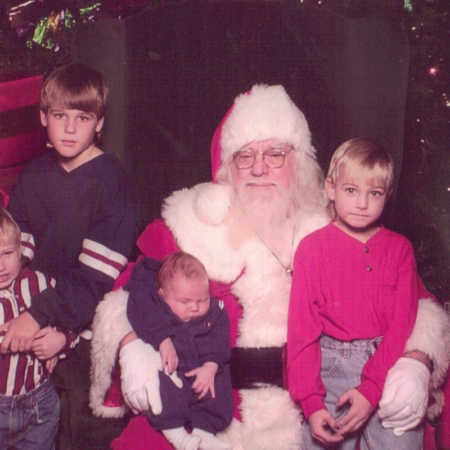 For several more years all 6 children would go with us to the mall for our traditional Santa picture. It became a fun joke to find just the right outfit for our visit; elf hats, stick-on mustache, No Shave November (yuck). But, as all kids do, they grew up and grew out. 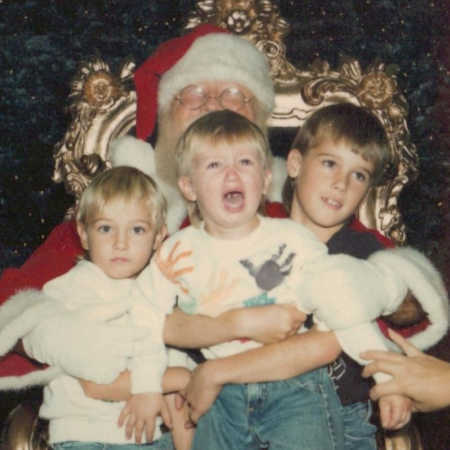 My stepchildren were not as determined to keep the tradition going, but the boys still called to ask what the plan for Santa pics was each year. If they were able to get together the 4 of them would head off to the mall. 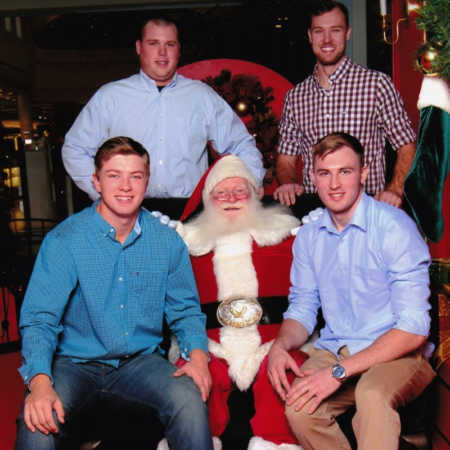 Two boys missed a year due to boot camp and deployment but once stationed stateside, they went with friends to see Santa locally. If they couldn’t be together – they were continuing it on their own. The pictures became more hysterical every year. New friends have been added. It was now perceived as a competition. We have had to change and move the wall due to the collection we have acquired. I never thought it would continue this long. 2018 marks the 30th Consecutive year that my 1st visited St. Nick and my youngest is at 21 consecutive years and counting. This year I went along with my sons and had my own little chat with Santa and told him my story. I handed him a Thank You card for helping to create magical moments for so many. Although unable to join their brothers, my middle 2 went with their wives in their new hometown. All of the new pictures have been added to the center of the Wall. I can’t wait to see what the future brings. 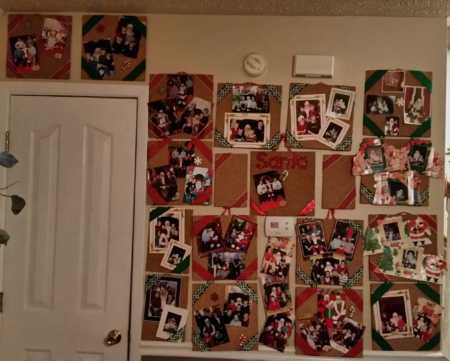 At our house it is an honor to be included on our Santa Wall. It is my reminder of Santa and his Christmas Magic. This story was submitted to Love What Matters by Laura Ivey. Submit your story here. For our best love stories, subscribe to our free email newsletter.